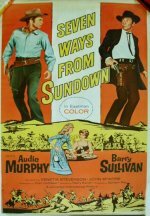 A very satisfying Audie Murphy western, in which he plays a Texas Ranger bringing in a killer (played by the ever-excellent Barry Sullivan) who gives Murphy more than a run for his money in the acting stakes. There's a nice wryness running through this Universal feature, with a cast of western veterans (John McIntire, Kenneth Tobey) to lend credibility. Although Murphy would continue filming big-screen westerns, this was his last of any real merit. By the way, the title is the Murphy character's name: Seven-ways-from-sundown Jones!